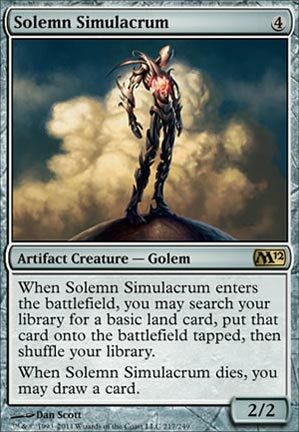 When Solemn Simulacrum comes into play, you may search your library for a basic land card and put that card into play tapped. If you do, shuffle your library. When Solemn Simulacrum is put into a graveyard from play, you may draw a card. 993 decks jouent cette carte.